Yesterday, March 29, was quite an experience. I had the privilege of meeting one of the greatest painters alive today, an icon of the POP art movement (although he says he doesn’t even like POP art :)). Below is the subject matter he is probably most known for. This was particularly exciting for me because I have been quite influenced by his work. 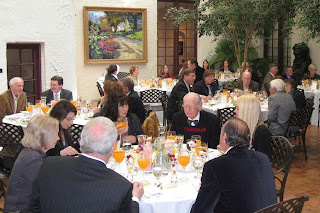 Which is one of the reasons I was one of 3 or so painters invited to have brunch with him. Not to many people make me nervous but when I shook his hand I think I said something like “It a honor to meet you Mr. Thiebaud. I’ve always admirer been work of your “. 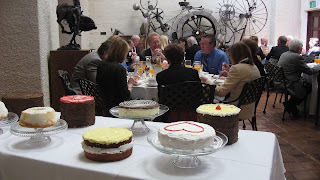 I wonder how many banquets he has been honored with that had cakes like this on the desert table :). The next two pictures have not been altered. 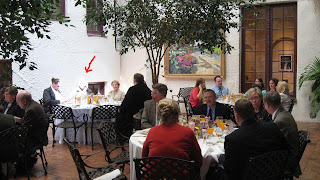 Look at the guy that looks like the source of light for the rest of the room. Thats me. I don’t know what wrong with me. 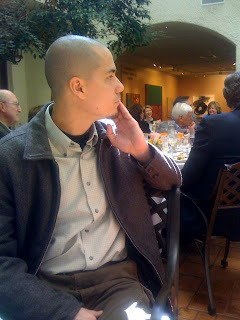 Maybe I was really hung up over the awkward introduction with Wayne Thiebaud. Actually I was having my retinas burned by a laser like stream of sunlight coming from a window opposite my seat. 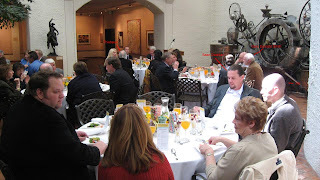 I labeled the 3 painters who I mentioned were invited to the brunch. Shawn Diediker, to my left, is a good friend of mine and a great painter www.diediker.com. Gary Earnest Smith is a Utah great to whom I have recently come to know a bit. 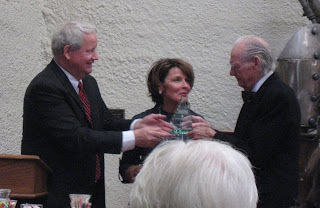 Vern Swansen of the Springville Museum of Art and Diane Stewart , a prominent supporter of all things art in Utah, presented Thiebaud with a “most honored artist of Utah ” award. Did I mention he lived in Utah as a teen? I hang on every word. I never said I was cool. 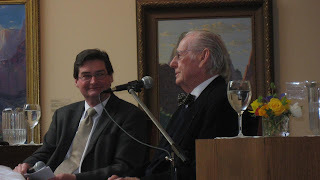 Following the brunch hundreds more showed up for a lecture and question/answer with Thiebaud. He was so impressive. I have to say the two things he said that impacted me most were that he doesn’t think of himself as an artist but a painter, that history will decide otherwise, and that,when asked who his favorite painters were he said that he loves all paintings. What a positive way to approach such a judgmental and critical field. I wish we were all that humble and positive. His paintings are worth upwards of a millions dollars but that attitude is priceless. Is that some kind of credit card slogan? Hmm? i’ve never seen you that dressed up for anything. except for church. thats respect. Oh man, Jeffrey – how I envy you being in the presence of Wayne Thiebaud. I wouldn’t know how to act. You rank right up there with him and the rest of the crowd. Great experience, thanks for sharing. That’s awesome – you really lit up the room! :)Humility is key when you are well known, I think. Not many people have it or can pull it off when they pretend to have it. When it is sincere though, it is truly remarkable. hows that studio check list coming along? I hope one day I can come to a banquet with multiple cakes honoring you. Mostly for the cakes, but for you too:)Thats really awesome, though, that you got to be invited when he has influenced you so much. It was neat to read about this side of you. I never have heard about people you admire and look up to. That is very wonderful you were able to be a part of something that meant so much to you. He sounds like an amazing man. 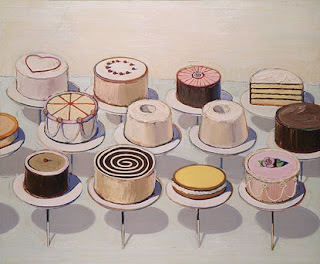 Jenny Meese pointed me to your blog–she knows I’m a fellow lover of Thiebaud. I can’t believe you got to meet him! I love his landscapes best of all. Thanks for sharing the Thiebaud love.